Hiya guys! Yes, you read the title correct. I am now part of the amazing group known as The Digit-al Dozen! I'm still in that dream state, like is this really happening. But I won't geek out too much cause I don't want to give anyone second-hand embarrassment for me, haha. To kick things off our first theme of 2016 is New & Improved. This means for the next five days I'll either be doing something I've never done before or improve on a past mani. I decided to treat the week as a build up, so start off with something easy and then do the nail fails at the end of the week. Sound good, eh? The mani for today consists of a technique I have never tried before... Sharpie nails! Yes, Sharpie like the markers! Remember the days we used to all color our nails with Sharpies/markers? Hmmm... I'm going to pretend you all nodded yes to that so I can feel better about my weirdo past. Okay? K. Seriously where has this been all my life?! Months ago (maybe a year at this point) I saw a gorgeous mani on Instagram from the super talented nail artist Angel from Twi-Star.com using this technique. I seriously don't know why I waited so long to finally get to it. I blame it on fear of the unknown and trying new things... I was actually just being lazy. If only I would of known it took no more than twenty minutes to create this masterpiece. It would of been less if I hadn't been drooling over the sparkle, hehe. Two vital things for this mani, Sharpie markers & rubbing alcohol. I didn't have the second so I improvised (high-five acing the theme double-time) and used hand sanitizer. Good enough and my hands smelled like Jasmine afterwards. Win. This is definitely one of those manis that you have to see to believe I am not full of crazy. I hope it's easy to follow because it really is nothing but doodling and blending. I'm not going to lie, I am hunting down all my previously unused Sharpies now to see what other combos and manis I can create. Hopefully next time I try this out I can use actual rubbing alcohol and get an even better mani out of it! Now don't forget to check out the other talented ladies from the Digit-al Dozen and their attempts at New & Improved. So much talent here! Love how this turned out! 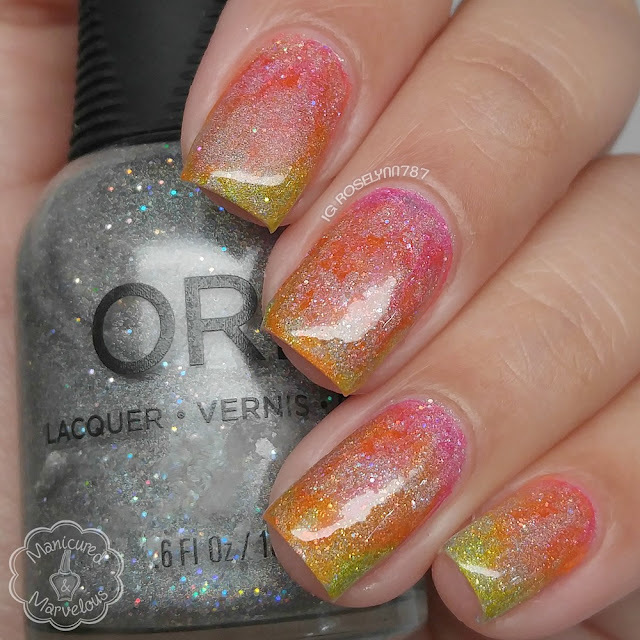 The colors go so well together and I love that you used holo! Makes eveything pop even more! So pretty! This is on my list of techniques to try soon too! I have yet to try this technique out but you made it look super easy! And wow is this color combo to die for or what!? Great work! I'm kind of scared to try these, too. They look super fun and I love the sparkly finish, too. I think you inspired me! Congrats on being in the Digit-al Dozen!!!!! These are gorgeous! I really like how this looks almost watercolor-y, but brighter! Congrats on joining the digit-al dozen! I can't wait to see your nail art! Interesting technique, but turns out great! I had never heard of this technique before but I love the look! Congrats on joining the group! O.o such an amazing look! Wow, these are stunning!! The colors are gorgeous! This is stunning! I need to try this!! !